Knock-out Whist is a member of the Whist family known by a variety of names including Trumps in Britain, Reduction Whist, Diminishing Whist (from the way one less card is dealt each hand) and Rat. It is often simply called Whist by players who are unfamiliar with the game properly called Whist. It is a basic trick-taking game and is a good way to teach the concept of "tricks" to children. The ultimate object of Knockout Whist is to be the last player still "standing" at the end of the game, with the object in each round being to win a majority of tricks. A standard 52 card pack is used. The cards in each suit rank from highest to lowest: A K Q J 10 9 8 7 6 5 4 3 2. The game may be played by two to seven players. For the first deal the dealer deals seven cards to each player and one card is turned up to indicate that its suit is the trump suit for the first round. (In subsequent rounds, the winner of the previous round selects the trump suit). 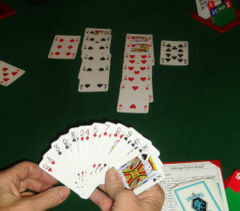 The player to the dealer's left leads to the first trick; any card may be led. The other players, in clockwise order, each play a card to the trick and must follow suit by playing a card of the suit led if they have one. A player with no cards of the suit led may play any card, either discarding or trumping. The trick is won by the highest card of the suit led, unless a trump is played, in which case the highest trump wins. The winner of the trick leads to the next trick. Some rulesets disallow leading trumps before the trump suit has been "broken" by a trump being played to the lead of another suit (though of course leading trumps is always permissible if a player holds nothing else). At the end of each hand any player who took no tricks is eliminated from the game. The player who took the most tricks gets to select trumps in the next hand. If two or more players tie for the highest number of tricks taken they cut cards to randomly decide who calls trumps. The deal rotates clockwise and one fewer card is dealt each hand (thus ensuring that the game must end, as eventually only one trick will be played). The game is won when a player takes all the tricks in a round, as after that there would only be one player remaining. An optional rule is that until the card count is at 5 a player can declare "no picture, no play" if no card in their hand is higher than a ten. All cards are turned in and the round is re dealt. Another variation is that, when the deal count is at four, any player holding one of each suit, heart, club, diamond and spade, declares that they have "rainbow" and automatically wins that round with no cards played. The card count then goes down to three. If more than one person has rainbow, then the cards are cut to select who calls trump. A different rule states that if a player does not get any tricks in a round, they are not eliminated immediately but get a "dog's chance" or "dog's life". In the next round, they are dealt one card and can choose when to use it - if they fail to get a trick in that round or any further rounds, they are eliminated. Each player gets one dog's chance. Some versions of this rule also allow for a "blind dog's chance", where if a player fails to get a trick but has already been down to dog's chance, they are dealt a face-down card in the next round but have to decide when to use it without looking at it. In this variation, if the player fails to get a trick in a round after they have been down to blind dog, they are eliminated. An optional rule allowing everyone to play on every hand is to deal one, and only one, card to each eliminated player. When it is an eliminated player's turn, they may choose to play their card, or keep it for a future trick. If an eliminated player is successful at winning a trick with their single card, they may re-enter the game. Otherwise, they will still be under "eliminated" status, and receive one card again for the next hand.